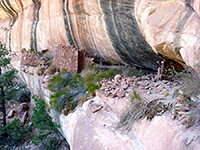 Most of the hundreds of ancient ruins on and around Cedar Mesa are some distance from paved roads, but not those in Mule Canyon, which are easily accessed from a trailhead beside UT 95, and so the hike along the ravine is one of the most popular in the area. The canyon has two branches, both aligned northwest-southeast, parallel to the highway, and as the south fork is closest and contains more ruins, that is the drainage usually visited. 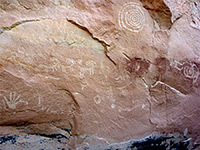 At least eight groups of structures are found along the sunny north side of the canyon over a distance of 4 miles, some close to the path, others up to 200 feet above, and most are straightforward to reach. They include a cluster of well preserved granaries known as House on Fire owing to the colorful, streaked sandstone ceiling above, and the unusual Wall Ruin, built in cavities in a vertical, potmarked cliff, and containing some intact rooms complete with all the original roof timbers. Even though Mule Canyon is relatively short, like others in the area it is a popular backpacking destination, partly due to the presence of a permanent water source - springs towards the upper end sustain short stretches of flowing stream, hence the hike is also a good choice for people with dogs. 23 views of the South Fork of Mule Canyon; gallery, slideshow. The official Mule Canyon trailhead is a dirt parking area between mileposts 101 and 102 of UT 95, from where a dirt track (eventually leading to more distant ruins in Arch Canyon) descends into the shallow lower end of the south fork, climbs over a ridge and drops down again to the north fork; trails follow each drainage upstream. An alternative start point, for the south fork, is half a mile west, at the end of a short, paved side road to the Mule Canyon Indian Ruins - this is a developed BLM site with interpretive displays and a partly restored mesa top pueblo, protected by a metal canopy. The parking lot is out of sight of the main road so would make a good camping spot, complete with rest rooms. From here, the trail along the south fork of the canyon is reached by walking northwards through a thin strip of woodland to the edge of the plateau, then scrambling down a steep, overgrown slope, meeting the path on the far side of the streamway. The trail along the South Fork of Mule Canyon is well used and easy to follow, all the way to the upper end, where the route is directly along the pebbly streambed. 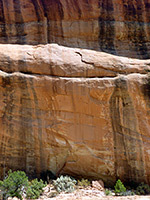 The canyon is shallow at first, enclosed by benches and low cliffs, which rise up gradually, becoming sheer and about 300 feet high at the deepest part. Car noise is audible in some locations, as the road is never more than half a mile away. A stream flows intermittently, forming a few deep pools, all easily passed. There is little undergrowth initially but more upstream, where the taller cliffs and flowing water create a cool, moist environment, allowing large fir trees to grow. 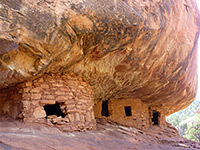 Site 1 - House on Fire: The famous House on Fire Ruin, also known as Flaming House Ruin or Flaming Ceiling Ruin, is located 0.9 miles along the trail, just as the canyon turns due north. A very short cairned path leads a little way up a slickrock slope to the well preserved ruin, which consists of a neat group of four or five granaries, built in an alcove. 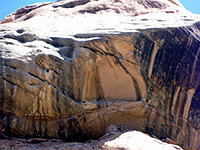 The Cedar Mesa sandstone in the ceiling above the structure has fractured and weathered to create an unusual radial pattern, resembling flames, especially when illuminated by reflected sunlight. 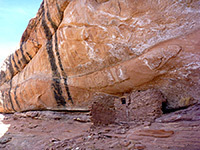 Site 2: The second ruin is 1.9 miles along the trail, a short distance after a minor north-side tributary; a small structure with two walls and a window, in a shallow, curving alcove, quite high up, beneath cliffs streaked with black desert varnish and partly covered by white salt deposits. Walking up to the ruin is easy. Site 3: The third site is larger and more impressive, occupying two adjacent alcoves, and including multiple rooms, well constructed walls and a neat row of steps. 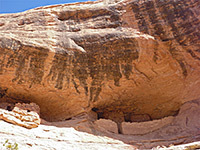 Like most ruins in Mule Canyon it is built at the base of the uppermost Cedar Mesa sandstone layer, which further west in the canyon becomes gradually higher above the streambed. A good view of the ruin can be had by scrambling up a steep sandstone slope (2.4 miles down the trail), but an unclimbable, overhanging cliff prevents entry. Site 4: Reached after 2.7 miles, the fourth site is just east of some distinctive vertical black streaks down the sandstone walls, formed by a transient stream flowing into the canyon; it is also just east of a narrow place along the main streamway, where the path has to climb a little way up the south side to avoid some obstructions. The ruin is reached by a 5 minute climb up a slickrock slope, aided by a tree trunk to overcome the final cliff face. The central part of the structure is a circular kiva lined by timbers, with remains of the roof nearby, and a granary to one side. All the wood is partially burnt, and some of the walls have collapsed, but the site is still interesting. Site 5: Most of the fifth ruin is hidden behind trees, so there isn't much to see from the streambed below, 3.3 miles along the path, but after climbing a steep slope, the site is revealed to be quite extensive. A granary, petroglyph panel and fire pit are spread along the foot of sheer cliffs, and there are many tiny pot fragments scattered around, while the main part of the settlement is about 20 feet higher up on a narrow ledge - remains of several rooms and much fallen masonry. This is reachable by climbing up via a log wedged in a crack in a protruding part of the cliff face. 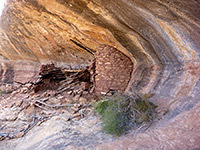 Site 6 - Wall Ruin: The best, most unusual ruin in the south Fork of Mule Canyon is situated half way along a short side ravine (3.7 miles from the start), which contains a spring and small stream, flowing through tall, segmented reeds. The rooms of the dwelling are built into ledges and alcoves on a vertical cliff face, the surface of which has been eroded into many tiny cavities. 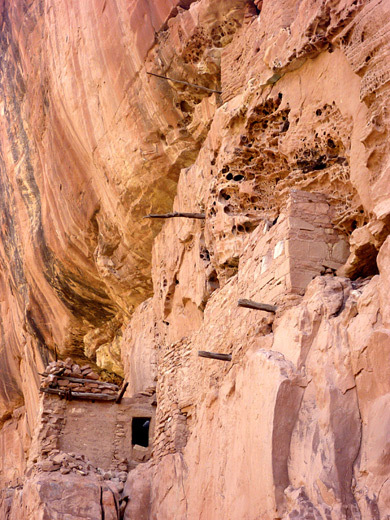 Protruding posts show where ladders used to be tethered to allow entry into the different levels, without which the upper parts of the ruin are quite inaccessible but the lower storey can be reached by climbing 15 feet or so, using a log as an aid. 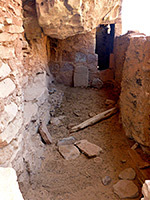 Known as Wall Ruin, the site has various passageways and small rooms, some with intact ceilings and relics on the floor, including metate stones and pieces of pottery. Site 7: Back in the main canyon, the next ruin is a small structure beneath a big sheer cliff, and does not seem interesting when viewed from the streamway below. Site 8: In contrast, the eighth ruin does look unusual but access is difficult; it is found 4 miles along the canyon just before the next north side tributary ravine, and is high above the streambed above a vertical cliff, but possibly reachable via a narrow ledge on the northwest side. The structure appears to have two rooms and a doorway that still contains a wooden door, hinged across the top.